Hitachi Asia is committed to contributing to society through its Social Innovation Business. For the past 90 years, the company has worked with various governments and organizations in Southeast Asia to build trains, water desalination plans, social infrastructure, power systems, electronic systems, smart traffic systems, among many more. Through these solutions, Hitachi Asia’s innovative technologies and solutions in the region has proven to raise efficiencies and help to lives better. 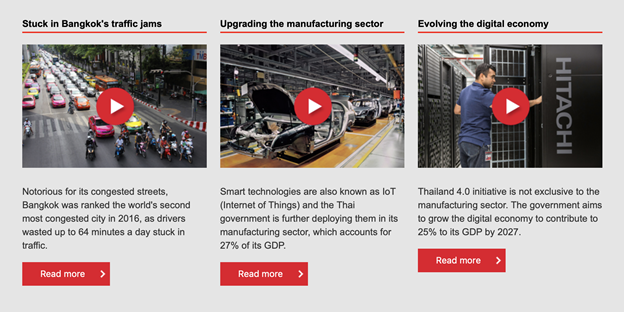 Although Hitachi Asia is a well-known conglomerate — the company wanted to engage more government decision makers and businesses to increase its social innovation efforts in Southeast Asia. But all that was easier said than done. Client confidentiality agreements prevented the company from creating stories that revolved around existing and past clients. In order to increase their presence, Hitachi Asia needed to produce content that could help drive engagement in the region. Brew Interactive’s thorough planning and research was key to Hitachi Asia’s effective content strategy. The first step of Brew Interactive was to leverage on social media tools such as Meltwater to aggregate big data and digital trends in different cities within Southeast Asia. This was an opportunity for Hitachi Asia and Brew Interactive to identify pain points, outline objectives and brainstorm relevant content marketing initiatives. Following their research, the Brew Interactive team found that one of the local population’s problems revolved around traffic congestion and access to technological infrastructure. For example, Brew Interactive found that one of Bangkok’s main problems was the rapid growth of its urban population. Bangkok had a population of 9 million people last 2010, and this number is expected to grow by 22% by 2030. From there, Brew Interactive matched societal problems with Hitachi Asia’s technological solutions. Given that the team found that the people within Bangkok, Ho Chi Minh and Manila regularly experience traffic congestions, Brew Interactive then created content about Hitachi Asia’s smart traffic system and IoT, which helped improve the traffic systems in these cities. 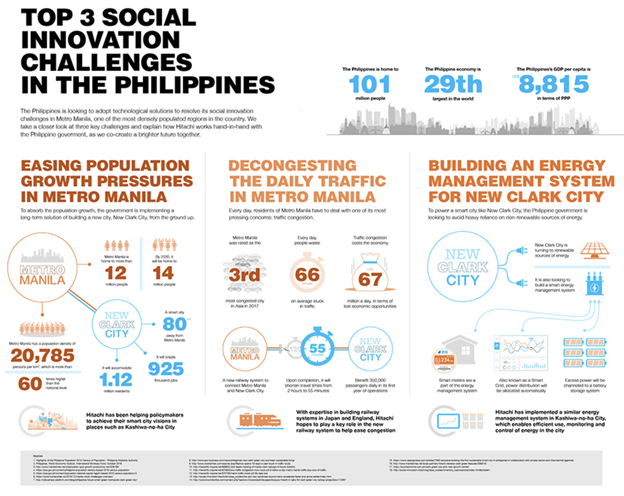 The agency also created infographics to illustrate how its technological products play a key role in resolving social issues to attract policymakers and business owners. To further amplify the message of social innovation around Southeast Asia, Brew Interactive was also commissioned by Hitachi Asia to take care of the brand’s social media strategy. As part of the strategy, the team also ensured that the content produced was being engaged with across all social platforms – Facebook, LinkedIn and YouTube. 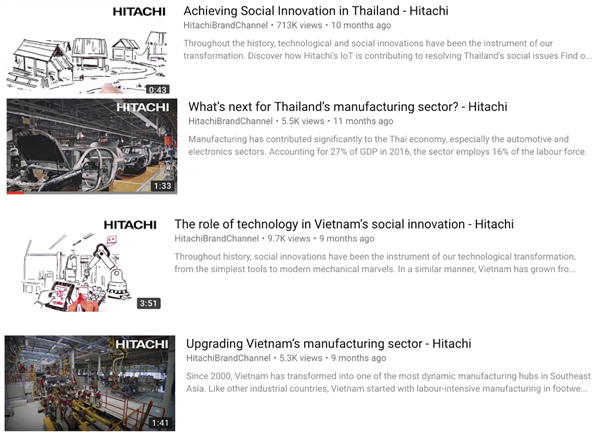 Hitachi’s YouTube videos have highlighted how government policies and their business initiatives have made an impact on local industries and the lives of millions. Over the years, the content that Brew Interactive created has been viewed by thousands of relevant stakeholders and decision makers across the Southeast Asian region. Through working with Brew Interactive, Hitachi Asia was able to create relevant content, grow a massive social following and appeal to audiences. 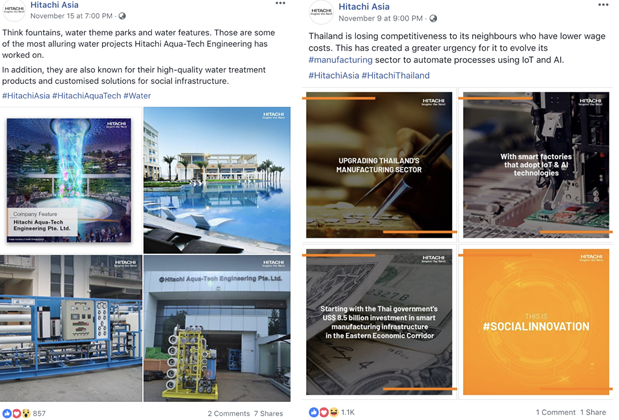 The Hitachi Asia Facebook Page now boasts of over 80,000 followers, making it one of the most widely followed and engaged technology and B2B brands in Southeast Asia. With Brew Interactive’s efforts to produce high-quality content, Hitachi Asia is now able to better engage with their audience, drive more traffic to their social media channels and educate policymakers and stakeholders about their Social Innovation Business. © Brew Interactive - Digital and Inbound Marketing Agency Singapore. All rights reserved.